Sonax is a new product line recently brought to the USA. Not a lot of people know about it, and even less have experience with it. I picked up some products while attending SEMA 2011 at the Sonax booth. Jason was kind enough to give me some great deals on products to try. Those that know me, know that I will not praise a product until I’ve given it a long trial run. In addition, if I don’t like it, I’ll tell you why and compare and contrast it’s attributes to others products that I do like. You will not find me doing a product review and faking my enjoyment for the product only to appease the manufacturer! I have been though so many products that I know what I like and don’t. 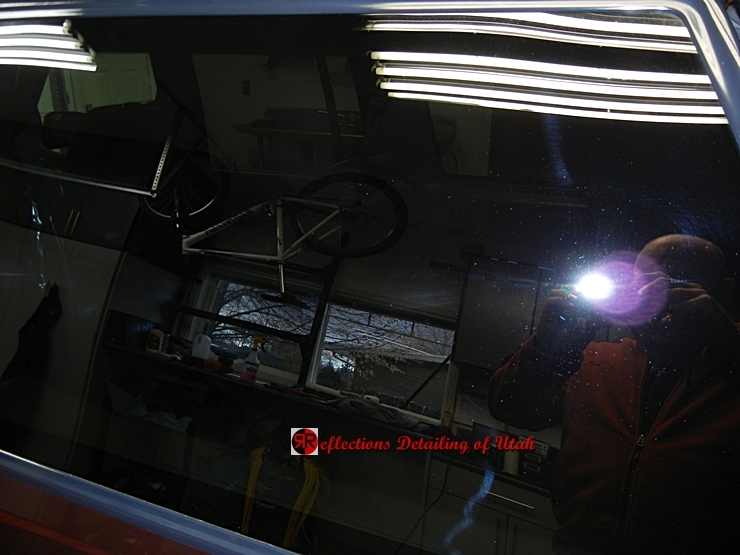 Now with that said, there are some products that are good but don’t fit my style of detailing…take D151 by Meguiar’s. 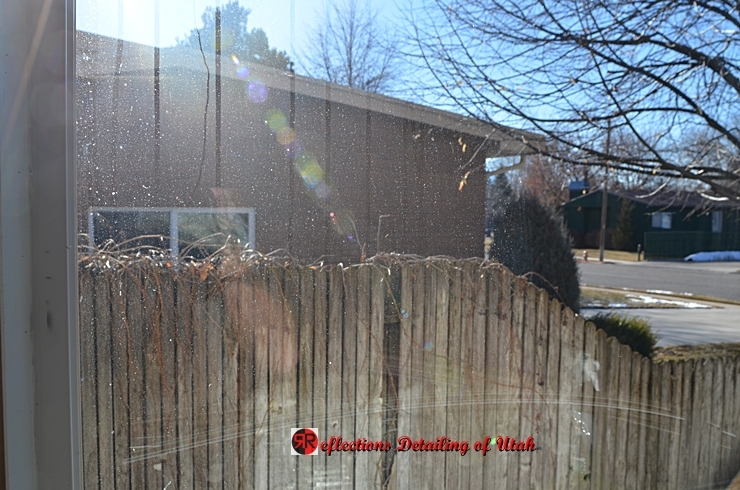 It’s a very nice product for an all in one detailing method, say for a used car dealer that wants to create a clean shiny look on a particular car. 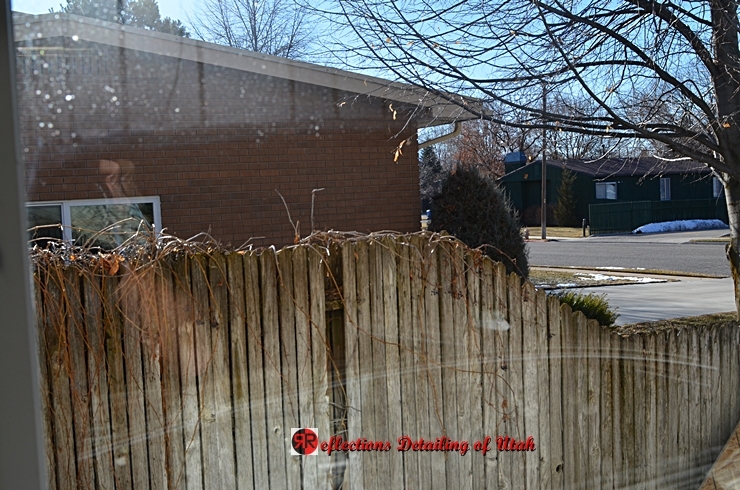 I don’t do that kind of detailing – I choose to spend my energies in extreme correction. So I’m always skeptical when I hear about some new product or company claiming champagne and caviar dreams. I digress… Back on topic. 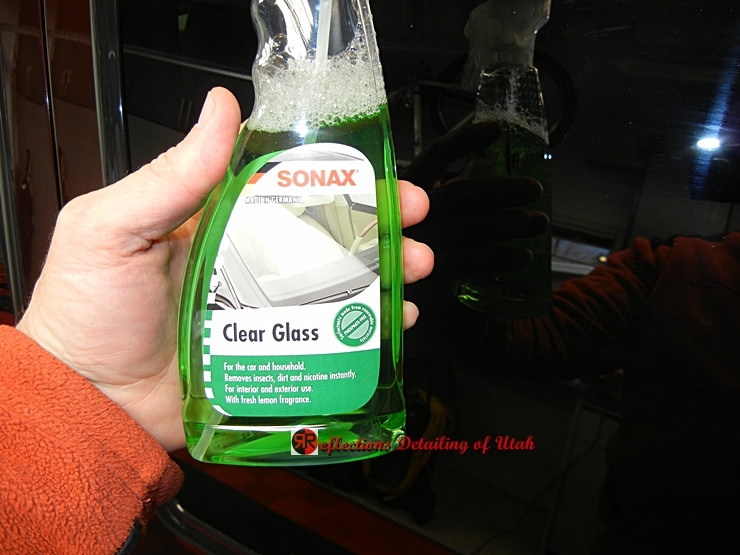 He told me , I “just had to” try out this Sonax glass cleaner. So since the price was right I gave it a whirl. I got home, put it on the testing counter of the shop, and continued to use my favorite glass cleaner, but that green solution would just stare at me…begging for a testing session. So I just grabbed it, did a few sprays and wiped…and wiped…and wiped…rotate towel…and wipe…and wipe…get new towel…wipe…wipe…done. And it looked amazing! I was turned off by the amount of effort needed to get to a clean glass state, but the “minty” smell kept the product on my mind. Luckily Jason called to follow up and I rehashed the initial use and my disdain for such a time consuming cleaning. He laughed and said I used way too much! Just a quick spritz is all he told me to use. How could such a small amount be correct? We all know that if a little is good, more is better…correct? So I gave his suggestion a second chance and low and behold…magic, it worked very nicely. No slight hazing, much less cleaning time, and it smells lovely. So for the next 4 months I used it off and on, trying to find a situation that it didn’t work on…I’m still trying as of this writing. It just works very well. I took it inside the house, let the wife and kids try it out…and in my best Emeril Lagasse imitation…bam…bam…bam it works every time. The shower glass is super clear, the mirror is bright…and now my wife wants her own bottle and the kids steal it out of the shop when they are on window duty! 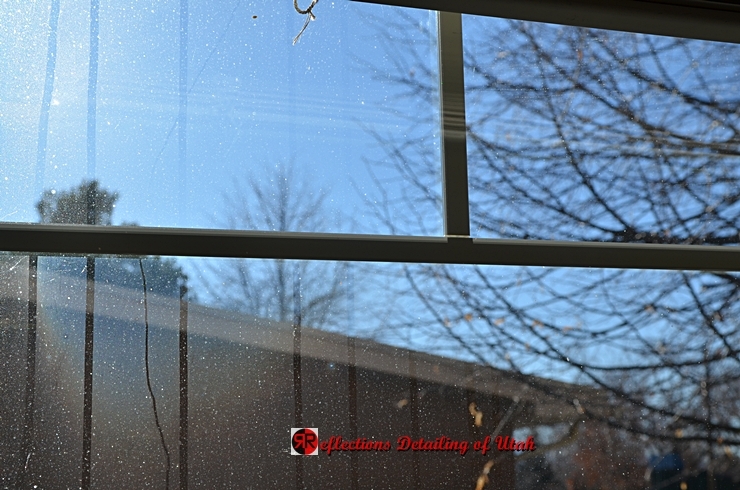 Is it a game changing window cleaner, superior to all others? No. Is it better than my go to product for the past 3 years? I’d say yes. I give a slight edge to the Sonax window cleaner. Will I be changing over totally? Only time will tell. Can it be used on hot glass in full sun? 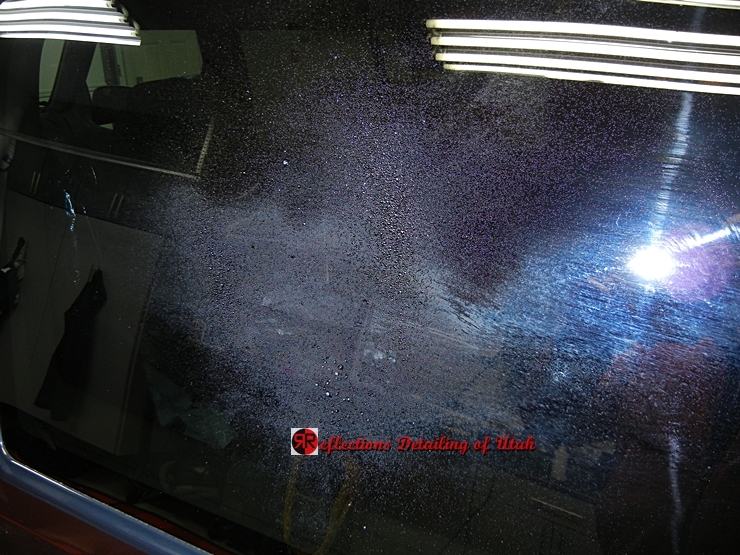 You can see in the flash area how much grime is built on the glass. While not perfect, I used a bit too much and I have some “glass grams”, a quick wipe and they are gone. You can see all the winter crap on my shop window. It is so heavy of a build up that the camera can focus on the crap! Much, Much better. You can still see I left a 50/50 for you to compare. I hope you find it a top shelf product, as I did. Thank you for taking the time to do this review. Please tell me, was Meguiars Glass Cleaner Concentrate (D-12001) among your previous “go to” glass cleaning products? If not, and you are experienced with it, how would you stack it against Sonax? Meg 120 glass cleaner is very nice too. We use a lot of that when we prep the cars at SEMA, its ability to be mixed in various concentrates is a useful tool. You can’t go wrong with either one. However, in my opinion the Sonax performance is better. This means I have a less likely chance of having to redo a section of glass when I use the Sonax. Granted you need to follow proper cleaning techniques in respect to towel use but I have way less re dos with Sonax Glass Cleaner. Much appreciated, Greg!!! As I always say….please keep the write-ups coming….they’re great!!! thanks for supporting the blog in its attempt to educate and share. I am not sure about USA market but in European markets SONAX Clear Glass is available in bulk containers (5 and 10 litres). In that case you have cost per use significantly lower. I’m checking into larger refills, here in the states……wish me luck! Great review Greg. 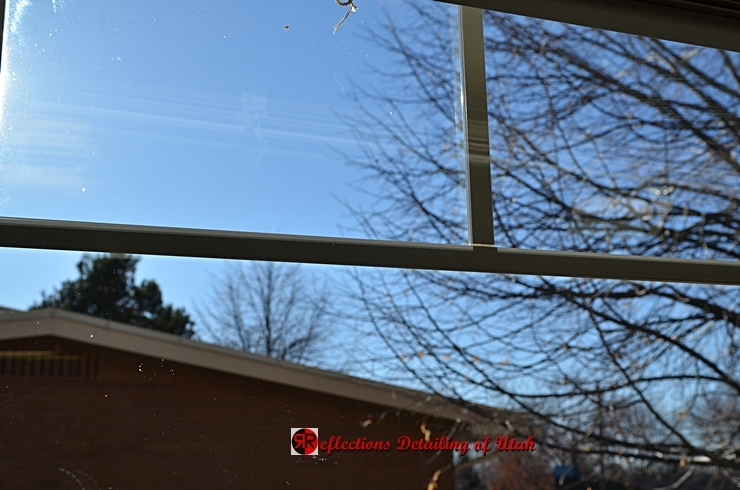 Years ago I was into trying many different window cleaners and found little difference between them. I found Meg’s 120 and just thought OK, my search is done, it cleans decent enough, it’s cost effective, and easy to use. After reading this my thought process is starting to change and I think it’s time to try some new glass cleaners out, starting with Sonax. Yep 120 is a nice cleaner and I have lots of time with it, it has some great traits to it for sure. I have found that the Sonax just works each and everytime……as long as I don’t apply too much. Greg…can you say if Sonax is a product line of BMW? Unlike Meg 120, Sonax Glass Cleaner is not dilute-able?